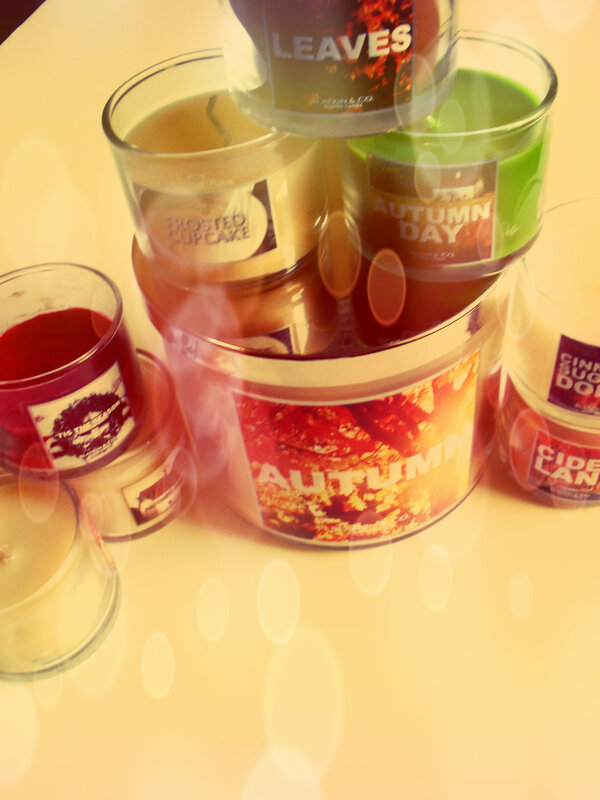 Bath & Body Works Fall Mini Candle Rave! 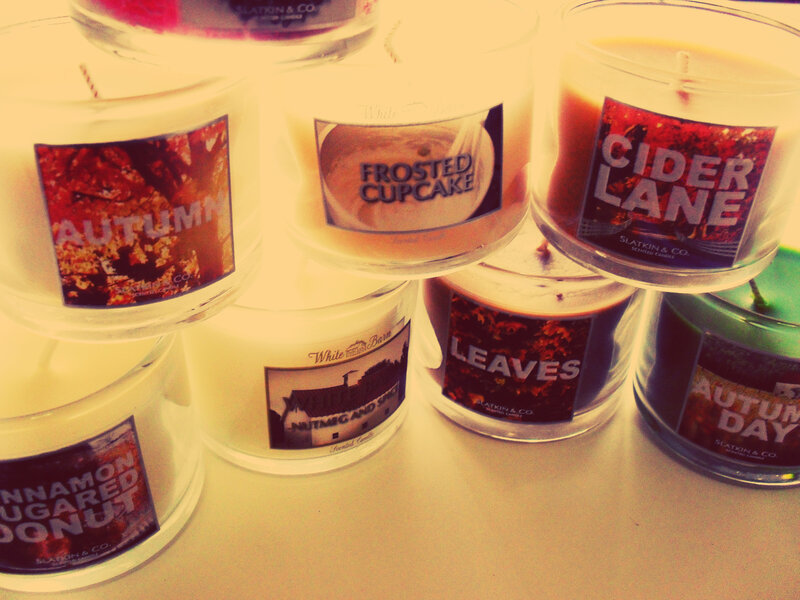 I am completely obsessed with Bath and Body Works’ seasonal candles! I remember when I was a little girl and my mom used to take me to the B&BW at our local mall. I loved testing all the perfumes, lotions, and body soap – and I still do, but right now I’m just completely in love with their candles. As a part of the Influenster Beauty Blogger VoxBox program I was sent a B&BW mini candle in Nutmeg and Spice, along with a coupon code. Being the shopaholic that I am, I immediately went online and put that coupon to good use! I stocked up on about 7 mini candles and one three-wick candle, along with numerous other B&BW goods (I couldn’t help myself, plus they had a sale going on!). So I thought I’d share my review of not only my Beauty Blogger VoxBox candle, but also the other candles in their seasonal line! White Barn No.1 Nutmeg and Spice – “A warm and cozy fragrance inspired by an elegant mixture of nutmeg and all of autumn’s very best spices”. I have to admit, Nutmeg and Spice was not my favorite candle. It was too heady and reminded me of my 12th grade science classroom (not a good place, trust me). Cider Lane – “As sweet as the trip to the local apple orchard each year, a delicious fall blend of mulled cider, warm caramel, and sweet cinnamon”. The caramel notes really come through in this candle, and the cinnamon and apple play nice background dancers. Frosted Cupcake – “A true food-lover’s delight – fresh vanilla bean, sugar, cake batter, and rich buttercream frosting mix it up and create and irresistible scent”. Easily one of my favorite candles ever, Frosted Cupcake smells as good as the description sounds! Autumn – “On the brink of sweater weather – this inviting fragrance blends dark pomegranate with red apple and notes of fir balsam”. I love this scent so much, I bought both a mini version and the larger three-wick size – the B&BW description is completely accurate. Cinnamon Sugared Donut – “Share the delight with a homemade vanilla cake donut covered in sugar crystals and crushed cinnamon”. There used to be this bakery near 14th street and 1st avenue that made these massive donut holes – they were so good and warm, always fresh, and only $0.20 each. For me, this candle reminds me of that place, it really smells like a warm cinnamon donut. Autumn Day – “A crisp, autumn medley celebrating the changing seasons and the beauty of the harvest with notes of fresh cut cedar, juicy fig and sandalwood”. I love, love, love this candle – it smells so much like my dad’s cologne in a warm comforting way. Plus, I love sandalwood –and it plays in so well with the other scents of this candle. Leaves – “Celebrate the brilliant colors of autumn with this rich blend of golden nectar, red apple and berries”. This smells so much like warm apple cider with cinnamon and cloves, it just makes me wish for Thanksgiving. Definitely another favorite. ‘Tis the Season – “Deep green pine, rich red apples and a touch of cinnamon blend to create a timeless and heartwarming holiday scent”. I love this scent so much that I burned through my whole mini candle in two days – it just plain smells like Christmas. Check out B&BW’s online store, Fall line of scented candles, as well as their recently released Christmas/Winter season scents here! Please remember whenever you burn flame candles like these to place them in a safe stable place away from flammable objects, or things that might tip the candle (and hot wax) over. Also, do not pour out the oil into the sink – you shouldn’t pour out any oil until the wick is fully burned (hot wax can be messy and dangerous if not handled responsibly). *I received the Nutmeg and Spice mini candle complimentary for testing and review purposes from Influenster. All opinions presented here belong to The NYC Talon, and are not influenced in ANY way (for more info, please see my PR page). Previous Post Goody Simple Styles Spin Pin Review!